StreetGlow H.I.D replacement bulbs utilize a high pressure charge of Xenon Gas, which has an excellent thermal efficiency unlike standard halogen bulbs. Standard Halogen bulbs use a charge of Bromine gas, which is not as efficient as Xenon gas. StreetGlow's use of Xenon gas increases the bulbs luminous flux by more than 20% giving light which has a brilliant output, far brighter than light produced by halogen bulbs of the same wattage. If you are looking for a high wattage xenon bulb, this is it. 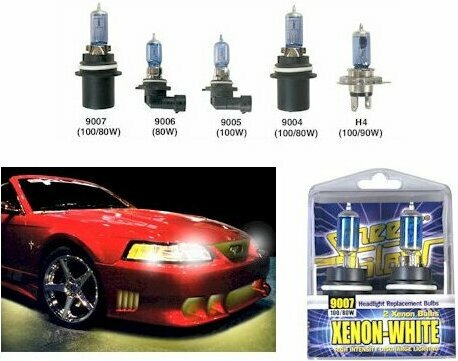 Upgrade today for the brightest, most intense, HID comparable Xenon Bulbs!! We are authorized StreetGlow dealer and carry full line of lighting products. These products are ALL AUTHENTIC, NOT "StreetGlow Replicas" w/ knock off prices & wannabe features that you may find somewhere else. Quality Made ; 1 year manufacturer warranty. Shipping is $2.49/Pair of Bulbs. We can accept cc, MO, check, or paypal. Always in stock & shipped within 48 hours. Shipping will take 2-5 days within continental USA. International Order is welcome. Shipping Tracking Number is available for all shipments. We will continue to better serve you as our value customer.